The Heads of State Summit with participants from 25 countries. 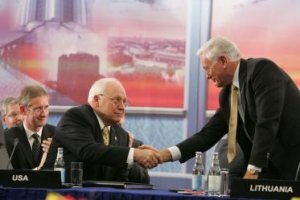 use of its vast energy reserves as "tools of intimidation and blackmail", its increasing authoritarianism and criticised opponents of reform in Russia "seeking to reverse the gains of the last decade". 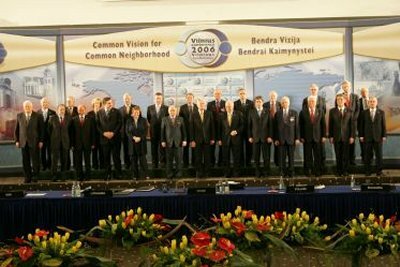 The conference, under the patronage of the President of Lithuania Valdas Adamkus and the President of Poland Lech Kaczynski, was held in Vilnius, May 3-5, 2006, with the aim of fostering cooperation between the Baltic and Black Sea regions and drew delegates from 25 countries. President Adamkus strongly emphasised that the conference was not against Russia, but "regrettably without Russia". Russia had been invited to attend and it was hoped almost to the last moment that Russia would participate, but in the end no high-level official Russian delegates came to Vilnius. The delegates acknowledged the conference to be a success. In a joint communiqué the conference welcomed "the initiatives to expand cooperation across Europe on informal basis in order to promote partnership especially at parliamentary, non-governmental and youth level, as well as people-to-people contacts" and urged "for the successful discussions of Vilnius Conference to be continued across Europe in pursuit of a common vision for, and common action in, our common neighbourhood".